Communism is a great idea…. on paper. I have the ability to make these delicious sandwiches…. you guys need to try them! Preheat oven to 350 degrees F. Slice the bread horizontally in half. Mix the butter and minced garlic. Lay the bread open and spread one side with garlic butter and the other with mustard. Stack the sandwich with ham, pork, bacon, cheese, and dill pickles. Wrap sandwich tightly in foil and place in oven for 15 minutes. Fall is here and although the Indian summer we are having in Minnesota does not warrant it, I’ve started making some of my favorite cool weather recipes. Squash is probably my favorite fall food. Albeit one of the ugliest foods known to man, I like to apply the old adage that beauty is on the inside. The beautiful color and amazing nutritional value make this a very appealing food. 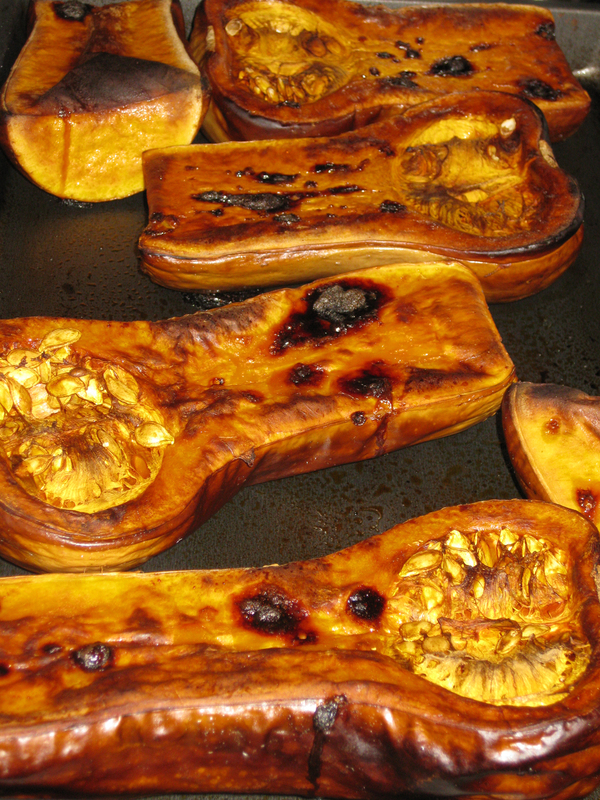 The curvaceous shape, the fervid color and the savory flesh makes butternut squash almost a hedonistic experience. Halve the squash the long way and brush the flesh of the squash with a little butter. On a sheet pan lay the squash flesh side up. Roast for about 40 minutes or until the flesh is nice and soft. Allow to cool and remove seeds. Add onion and butter to a large pot and cook until onion is translucent. Scoop out the flesh from the squash and add to the pot. Add chicken stock. Bring to a simmer and about 15 to 20 minutes. Puree the soup with a stick blender or place soup in a blender and puree and then return it to the pot. Stir in honey and season with nutmeg, salt, and pepper. If you enjoy a more creamy soup, add ½ cup heavy cream. In a universe as vast as it is delicious, a small but powerful force has existed for centuries. Protectors of tenderness and flavor, they are called the Condiment Corps. taste buds in the Universe, their fate and the fate of Earth lie in the hands of their newest recruit, A1. A1 is a gifted and cocky dipping sauce, but the condiments have little respect for simple sauces, who have never harnessed the infinite powers of the marinade. But A1 is clearly the missing piece to the condiment puzzle, and along with the encouragement of fellow dipping sauce and childhood sweetheart Heinz 57, A1 may prove to be not only the key to defeating Overkoox…he will become the greatest condiment of all. Holy Guacamole, training camp starts today! I’m joining a fantasy football league. This is strange because I don’t particularly care for football. I don’t have even a vague comprehension of football plays or stats. And I don’t know (nor do I care to learn) the difference between “off sides” and “false start”. What I do seem to have developed, is a bizarre obsession for watching organized sports and the corresponding commentary that accompanies them. I’ll watch anything. Football, Baseball, Golf, Tennis, Soccer, Bicycling, Competitive Juggling. I just can’t seem to get enough of the competition. I just finished the 3 week television marathon that is the Tour De France and now football training camp is already here. I’m looking forward to football season. Waking up at 7:00am on Sunday, turning on the early morning analysis and watching it 4 times on repeat before noon kick-off. I want to put on my slippers and my comfy jeans and my purple long-sleeved t-shirt (Go Vikes!) and get psyched about meat heads and their barbaric needs to hit each other. I can’t wait for Jimmy and Terry and Howie to tell me who the better team is going to be and then be dead wrong about it. I can’t wait to make homemade guacamole. In a large bowl place the scooped avocado pulp and lime juice, toss to coat. Drain, and reserve the lime juice, after all of the avocados have been coated. Using a potato masher add the salt, cumin, and cayenne and mash. Then, fold in the onions, tomatoes, cilantro, and garlic. Add 1 tablespoon of the reserved lime juice. Let sit at room temperature for 1 hour and then serve. Certain people have a thing for pickles. Let me specify. Certain people in this household have a thing for pickles. Add ice halfway up the cocktail shaker. Add gin, vermouth and pickle juice. Shake well and strain into 2 martini glasses. Garnish with a pickle spears. Proud and open defiance of the law, from one in a position of exalted authority, is devastating to civic order. Melt butter in saucepan over low heat. Stir in sugar and cocoa, turn stove off. Add one egg and blend, then add the second egg and blend. Blend vanilla, add flour. Pour into greased 9″ baking pan. Preheat oven to 350 degrees. Bake 20 to 25 minutes. It’s Earth Day 2010 and now more than ever we should really not only be aware but start taking action to preserve our planet and its resources for generations to come. My mom and I went to see Jane Goodall speak the other night. It was fantastic to see the passion and conviction with which she carries a torch for the cause of not just animals, but the planet and the human race. Her blunt and at times bleak assessment of our current situation has not deterred her from sending out a call to action. She impressed on everyone that the time to simply educate ourselves to the plight of our planet is over. It’s time to start doing something about it. I’m not a tree hugging fanatic about this stuff. I’m just one of those well intentioned people who makes a concerted effort to turn off the faucet while I’m brushing my teeth and to hang my clothes out to dry when it’s a nice day. I sometimes don’t have the patience to thoroughly clean out my peanut butter jar for the recycling and I throw it in the trash instead. Yes, that makes me feel a little guilty. Earth Day is just a great reminder for us all to live a better life, for the planet and for ourselves. For Earth Day this year, I’m having some friends over for a organic and sustainable dinner party. I’m not going to fill this page with outrageous statistics about how our planet is in peril. God knows there are some whoppers regarding this issue. I’m going to assume that we are all rational people who believe in and are threatened by global warming and I’m just going to let you know that you can learn more about sustainable living on these great websites. Sustainable Table & Sustainable Food. They are a wealth of resources to kick start your journey to treating yourself and the planet a little better. Even if you can’t commit to big changes, every little bit helps! Just be a little more environmentally aware and have a Happy Earth Day! Combine the wine, sugar, cinnamon stick, cloves, and zest strips in a large sauté pan. Bring the mixture to a boil over medium heat and cook, stirring occasionally, for about 5 minutes. The sugar should be dissolved and the sauce will have begun to thicken. While the sauce is cooking, peel, halve, and core the pears. Add the pears to the sauce and spoon it over the pears to generously coat them. Cover, remove the pan from the heat, and set the pan on a trivet. Allow the mixture to cool to room temperature, about 30 minutes. Transfer the fruit and syrup to an airtight container and refrigerate until well chilled, at least 2 hours and no more than 3 days. To serve, remove the cinnamon stick, cloves, and lemon zest and divide the fruit and sauce among 4 bowls. The Holy week of Passover started yesterday. For Passover Seder we recounted the Exodus over Kosher spaghetti and meatballs. Now, I’ll be honest, we’re not Jewish. We’ve just adopted some Jewish traditions to round out our spiritual experiences. I really love inventing recipes that meet the unique dietary constraints of kashrut and other Jewish laws. We are very fond of the tradition and spiritual connectedness we feel when we celebrate Jewish holidays. They have rituals and traditions that feel so natural, it’s as though you have done them your whole life. Go on… get your Irish up! St. Patrick’s Day: The holy day of family obligation. Today we celebrate our Irish heritage with songs about love that are doleful and morose and instill that regretful feeling that love can be fleeting. We also celebrate with the songs of battle that are merry and impassioned and always remind you that fortune favors the brave. So, puff out your chest and wear your heart on your sleeve, because it’s no good being Irish unless you prove it once a day. And here’s to all under it, may they be well matched. English apple pie recipes go back to the time of Chaucer. Who would have very much enjoyed my friends, a motley crew of middle-class folk. Sift flour, sugar, salt and nutmeg into large bowl. Stir in beaten egg, sour cream and vanilla. Fold in apples, spoon into unbaked pastry shell. Bake at 400 degrees for 15 minutes. Lower heat to 350 degrees. Bake 30 minutes longer. The romantic glow of blistering coals or casual flames tenderly satisfying the hunger of nectarous flesh. The seduction of searing, smoldering, sizzling sustenance. Melt butter. Sauté onion until soft. Add remaining 8 ingredients. Simmer for 20 minutes. Makes about 2 cups of BBQ sauce.